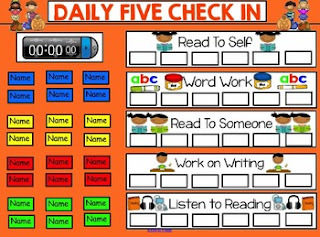 This colorful Fall inspired Daily 5 Check In SmartBoard is sure to get your kids excited about Daily 5 learning and learning to make choices! There are five slides to use for check in. You can use just one or use the different colored ones for different days or rotations. Files can be saved by day, for the week or over the course of the year by using the "Save As" button and saving them by their date. 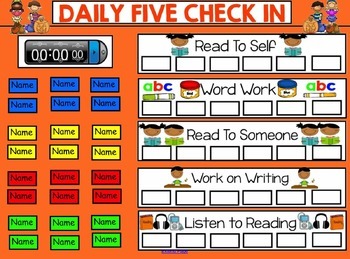 You can also clone the page and add to different color backgrounds for different days of the week or different rotations. Instructions are given in this file on how to input student names into the boxes. Once you have done this one time, you will have the names to copy and paste throughout the year for all sorts of Smartboards including attendance, lunch count, class graphs, etc. There is also a link to my blog to learn how to do screen shots if you want to learn how to ensure names don't accidentally come ungrouped. so you can learn more about using technology in your classroom to advance student learning. ***IMPORTANT NOTE*** Please remember that if you are having technical difficulty grouping, ungrouping, cloning, doing screen shots etc as you start to personalize your files that these are issues you campus technician can help you with or you can email me to help you, however, these are not grounds for leaving a poor feedback. Learning to use Smart Notebook software can be difficult and frustrating at first until you get the hang of it, so please seek out help if you feel something is not working correctly as there is often an easy fix. Thanks! Please also note - this is a Notebook file for use with Smartboards. I believe there are ways to convert these files to other formats however I do not know how to do this and therefore you would need to ask your campus technician if you are using a different type of board to see if it is compatible.